The Mens Mountain Trainer Mid GTX Boot is a lightweight summer alpine trekking boot with a robust suede leather and fabric upper plus waterproof and breathable Gore–Tex protection. Designed to provide extra flexibility and increased comfort on both ascents and descents during alpine trekking in mixed and technical terrain, the Mountain Trainer Mid GTX has a new midsole with dual–density Bilight Technology which is ergonomically shaped to cradle your foot and provide all–day comfort on longer hikes. At the ankle, the Flex Collar allows natural movement and adaptability during descents for extended comfort, even when carrying a heavy pack. Underfoot, the lightweight, compact Vibram Wrapping Thread Combi (WTC) sole delivers solid yet forgiving walkability. 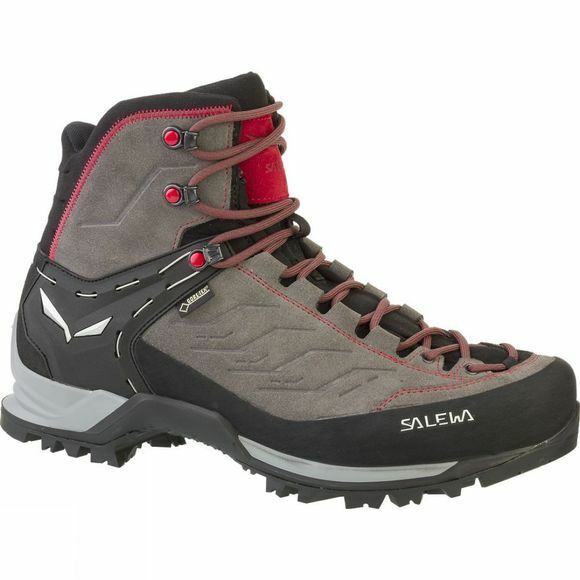 And Salewa’s patented 3F System provides flexibility and support. In addition, the Gore–Tex Performance Comfort lining delivers optimised weather protection and climate comfort.